WHY DID TOP RANK LAWYERS SEND THE TERMINATION NOTICE TO VISIONQWEST? Late Saturday evening, FightHype.com recieved word that eight-division world champion Manny Pacquiao decided to terminate the services of VisionQwest Resource Group, the very same company he hired to handle both his business and personal accounting affairs. The news came on the heels of a FightHype.com report citing a source who informed us that Michael Koncz held a private meeting with Pacquiao, armed with documentation given to him by Arum which made it appear as though VisionQwest "tricked him" into signing a power of attorney that granted them full control of his business affairs. Naturally, Koncz adamantly denied the report, saying, "Bob has never interfered with Many Pacquiao's businesses or who Manny Pacquiao hires." However, Michael Lodge, President & CEO of VisionQwest Resource Group, made it clear to us that someone was indeed interfering with their affairs, telling FightHype.com, "VisionQwest has been made aware of an attempted interference from individuals and we are addressing these issues with our client." Although he did not name Michael Koncz or Bob Arum specifically, the news did indeed match the information provided to us by our source. Coincidentally, representatives of VisionQwest were scheduled to have a meeting with Pacquiao in order to "address all open issues", but before that meeting ever took place, they received word of their termination via fax from Pacquiao's Los Angeles-based attorney. "Our office just received a letter via fax from Manny's attorney from Los Angeles terminating our services," Lodge informed us via email. "There has been a lot of pressure upon Manny from outside sources to remove us from his accounting." Once again, Lodge made it crystal clear that "outside sources" were interfering and putting pressure on Pacquiao to remove VisionQwest from his services. Even more interesting, however, is that our source informs us that the Los Angeles-based firm who faxed the notice of termination was the very same law firm that represents Top Rank Promotions. "It was the same law firm that represents Top Rank, O'Melveny & Myers. They sent the fax," our source informed us. For those that are unaware, famed attorney Daniel Petrocelli is a partner at O'Melveny & Myers. Both he and fellow partner David Marroso have represented Top Rank Promotions in a number of legal matters. In fact, in December of 2009, Manny Pacquiao retained the services of Petrocelli, no doubt a suggestion of Bob Arum, to file the currently ongoing defamation lawsuit against Floyd Mayweather. Thus far, the lawsuit against Mayweather has been the only involvement that O'Melveny & Myers has had in Pacquiao's affairs, as he also has another attorney of record, Franklin Gacal, who acts on his behalf. Evidently, it appears as though O'Melveny & Myers is now getting much more involved in Pacquiao's business affairs as VisionQwest's termination notice was received from their Century City office, as opposed to it coming from Franklin Gacal, who typically handles Pacquiao's business contracts. Although Koncz denied that Bob Arum had anything to do with Pacquiao's decision to terminate VisionQwest, it's becoming clear that Arum has a lot more influence on his business matters than Koncz cares to admit to. 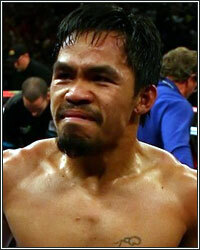 Top Rank Promotions has already taken over control of handling Pacquiao's endorsements. Surely it seems odd that the same law firm that represents Top Rank Promotions is also getting much more involved in Pacquiao's business affairs. It doesn't take a rocket scientist to figure out that, with Top Rank's law firm also representing their fighter, it's a win-win for them as there won't be anyone to monitor them and keeps things in check. Then again, maybe it does take a rocket scientist to figure it out since Congressman Pacquiao clearly sees no problems with this arrangement.